like the candle in the saying. September 21, a day before the equinox occurs here in North Central Washington tomorrow evening when the sun crosses the equator. It’s Sunday, fittingly a hot, sunny day here in the high desert, even though this morning I needed a hooded sweatshirt when I got out of my warm bed, the window open to let in the night’s coolness. I taught a yoga class at 9:00, subbing for a friend who is teaching a workshop in Mexico. It was a small class–people tend to like to stay with their own teacher–but that was fine. I enjoyed practicing with the three folks who came. I spent last night worrying a little about what kind of class to teach. Me worrying about yoga is a rare occurrence. Typically, I enter a sort of flow state once I sit down and start to teach, and the class unfolds from someplace in Being that I have no control over. But I expected a big group of regulars, and I felt a little uncertain whether my style of class would be suitable to them. I thought about doing a class on balancing, this being the equinox and all, but in the end, I gave up and went to bed, and this morning I felt the ease of my own practice leading me to the one I would teach. I spoke about the nature of Tantra, and how it aligns with my yoga style. Tantra, to me, is a kind of radical acceptance. Accepting the way things are rather than trying to shift them. Yoga classes sometimes tend toward the transcendental: attempting to shift practitioners into surrender, or bliss, or even acceptance. Yet surrender, bliss and acceptance must arise on their own. Yoga asanas can help bring us more deeply into our bodies, and from our bodies into awareness, and through awareness we can find our way to what is troubling us. Listening to the body. Feeling it. Feeling the stuck thoughts or emotions creates a small space through which release and relief can enter. This led naturally enough to the equinox, which should be a good lesson to us in the difficulty of achieving equanimity. Only twice a year is the sun positioned so that we have equal hours of light and dark. All the rest of the year our days, weeks and months are a series of gradations from more light to more dark and back again. Autumn. Its etymology from the Old French is “the drying up season.” Harvest. End of summer. The Anglo-Saxon word is fall–a useful metonym and metaphor for what happens around us if we live amongst deciduous trees that shed their leaves in a rain of glorious color. A flaming death. As the poet Mary Oliver says “the trees are turning themselves into pillars of light.” After the blossoms, the fruit. After the fruit, seeds. After the seeds, sleep, deep and dark and long. This is where we are. The time of shedding, harvesting, gleaning. The sun is on its path; we’re on ours. May the shortening days autumn carry us into a richness of Being, a sowing of mysterious fruit. Some reflections on the MVCS overnight camping trip. We have a saying here at the MVCS, which is “can you help me?” We practice it in our morning circle as we greet each other and the new day. Each of us has gifts to share and needs to be met. 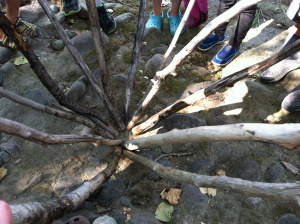 On our walk through Twisp Ponds on the way to our river camp out, we asked the trees and woods: can you help us? And they did. They gave us some of their wood to make into cooperation-walking sticks. Each stick was adorned with a piece of red yarn. So we crossed the river, which, even though it is low, is still rocky and flowing and deep in places. We held hands and held sticks and slowly made our way across to the land stewarded by Nate Bacon and Christina Stout where we made our camp for the night. It all starts with movement. Every day, we move, but how do we move? Do we move to the inner workings of our arising Being nature, or do we move to the thoughts of our minds? There’s a grace in leaning into what arises. What is in the field? That is what is. Once the mind draws back from its agenda of expectations–what should be–to what is, movement becomes fluid. I dreamed recently that I was walking somewhere with a very drunk celebrity of some sort, let’s call him a poet. I could feel in every layer of my Being how delicious he felt, the way our bodies resonated with each other was like home. I felt my fingers touching his arm, his body along mine. It was a sort of rapture. Walking behind us was a tall, thin woman with her hair in a severe knot who kept leaning toward me saying “what are you doing? What are you doing?” And I said “It’s okay; I’m just playing with him.” And I meant that in the literal sense; we were at play. After that I woke up. Recounting the dream later, I saw how the parts illustrated this concept of movement and expectation. Of Being and the desire to control Being. Being is the drunk poet with whom we can play in a delicious connection, and the mind is the severe voice of fear: what are you doing? Of course, Being does not always arise in a way that is delicious. Just as often it arises in a way that is tortuous, or nauseating, or painful. Still, what I am realizing is that even this is a sort of gift. Once I lean into what is uncomfortable, there’s a kind of relaxation. I guess what I’m saying is that relaxation is relaxation. We can relax in a bed of feathers and we can relax on a bed of nails. Everything that we encounter is an experience. My teacher Allan Morelock recently said something along the lines that experience is Being’s way of showing it what it feels like to be alive. This is an old teaching. It runs through most of the world’s great spiritualities: turn the other cheek, don’t create unnecessary suffering, understand that the world is illusion. And these teachings can be used either for good or for ill. Awakening to our true Being nature gives us the continual opportunity to practice relaxation. What changes is not our experience of life but our relationship to those experiences. Relaxation is like surrender. You can’t “make” yourself–or anyone else more to the point–relax. It comes from within. It comes from a courageous heart. There’s an important Vedic concept represented by the Sanskrit word: Hridayam. It’s a kind of onomatopoeia. Heart I am. Hridayam. That which nourishes the heart. We can best nourish the heart by feeding it what it needs. There’s another old teaching. A sage told a boy that he had both a tiger and a lamb in his heart. Which is stronger, the boy asked? Whichever one I feed, he answered. So if you feed relaxation, relaxation will be stronger than resistance. So when the Drunken Poet of Being shows up in the dream that is your life, walk with him. Relax. He knows where he is going.